Christmas means family get-togethers, reunions with friends, festivities, and of course, tons of food! King Sue’s new chef-consultant, Katrina “Kat” Cua of katshappyfood.com, has great Christmas recipes using the brand’s ham and assortment of meat products. She brings her experiences to the fore through easy-to-prepare yet delicious dishes that are perfect for the Noche Buena feast. A graduate of BS IHM Culinary Arts at Enderun Colleges, Chef Kat worked for some hotels in the country, as well as in France and in a New York bakeshop. She loves French cuisine and infusing it with Asian flavors. She grew with King Sue and is very fond of its meat products. 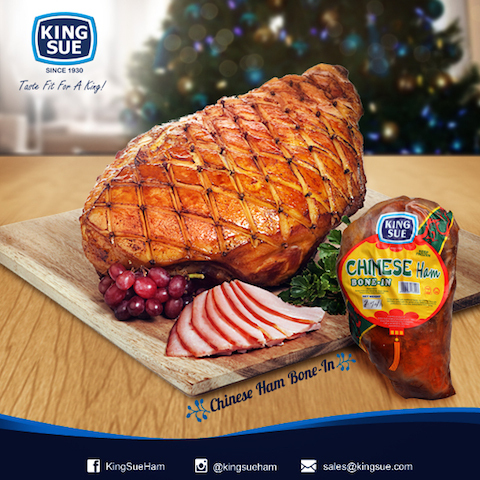 Chef Kat believes that no Christmas table is ever complete without the traditional King Sue Chinese Bone-in Ham and other premium ham and meat products. “There’s King Sue’s Sweet Ham prepared with a touch of sweetness. The smokey flavor of Pina Ham, meanwhile, goes well with cheese and wine spread. There are other King Sue products that are great for the Christmas menu. I love their thick cut boneless bacon slices; you cannot find anything like them anywhere. I also like other bacon cuts such as bits and cubes which I add to my stir-fried vegetables and stews,” she said. Chef Kat shares these holiday recipes using King Sue products so you can entertain your loved ones in a festive, sumptuous style. Happy Holidays from King Sue! May your Christmas get-togethers be the most delicious yet! Prepare the egg wash (1 egg yolk, 1 tbsp, milk, pinch of salt) . Mix all the ingredients and set aside. In a saucepan, melt butter and sauté chopped apples. Add the orange juice and cook the apples until soft. Add the KING SUE CHORIZO BILBAO, brown sugar, flour, cinnamon, nutmeg, and salt. Turn off the heat and add the orange zest. Cool and set aside. Cut each puff pastry sheet into 4 equal square portions and keep chilled until ready to fill. Place 1/3 cup of the apple mixture on half of the square. Fold the pastry diagonally over the apple and KING SUE CHORIZO BILBAO mixture to form a triangle. Seal by pressing the edges with a fork. Transfer to a sheet pan lined with parchment paper. Brush with egg wash and sprinkle with brown sugar. Bake for 20 minutes until brown. Serve warm or at room temperature. Carefully scrape the starch covering the ham. Wash completely. Place ham in a pan. Cover with enough water and set aside for 4 hours. Every hour, change the water of the ham. This is done to remove the excess salt. Note: Do not soak overnight. Place the ham in a pan with approximately 3 liters of water or enough to cover the ham, with skin facing down. Slowly bring to a boil, skimming away any foam that forms on top. Gently simmer for 30 minutes. Drain and discard the water. Mix all the ingredients of the cooking liquid in to the pan. Add 6 cups of water, then place the ham with the skin facing up as not to stick on the pan. Bring to a boil and once it reaches the boiling point, reduce the heat. Simmer until fully cooked. One indication that the ham is cooked is when you can easily pull the fork back out. Another indication is when the meat starts to separate from the bone as well as the skin with meat. Be careful not to overcook as it will fall apart. Remove the ham from heat. Marinate in the cooking liquid for a minimum of 12 hours. For better presentation, remove the skin and place brown sugar on top and torch the ham until it caramelizes. Prepare the onions, and bacon. Set aside. Prepare the egg wash (1 egg yolk, 1 tbsp, milk, salt) . Mix all the ingredients and set aside. Make ridges all around the edge of the puff pastry. Spread the mustard on the puff pastry. Add the KING SUE BACON SLICES and caramelized onions on top of the puff pastry, not exceeding the ridges. Sprinkle with dried thyme and freshly cracked pepper. Brush edges with egg wash.
Bake until pastry is golden brown about 25 minutes. Let cool on a wire rack for 5 minutes. Cut into squares and serve immediately.